The second part of ModDB's interview with Andres Bordeu from ACE Team. Zeno Clash. It’s a game that few anticipate, yet thanks to its finalist placing in this year's IGF, it could be one that may have the internet singing its praises later this year. Here at ModDB, we are not ones to wait so consider this a sneak peek at a title that has the potential to become one of 2009's best independent releases. What follows is the second and final part of an interview with ACE Team's Andres Bordeu. You can read part one here. Fight Club in the forest. ModDB: From the trailer, there seems to be an amazing amount of variety in the creatures you encounter. How many different creatures can we expect to see in the game? Andres Bordeu: We have a great amount of characters, animals and weird “beings” in our game. A diverse world had to be populated with a diversity of creatures. We’ve put a lot of effort in making sure that players are continuously encountering new characters. In a fighting game it’s important that your adversaries feel like they have their own personality, not that they’re just another monster from a monster gallery. All of our characters have distinctive sounds, taunts and facial expressions that set them apart from each other. I’ve played many games with very well developed characters that are great to encounter, but some of these games populate their worlds with very little diversity of characters. We wanted to make sure that the novelty and diversity of the art applied to both the environments and the characters. 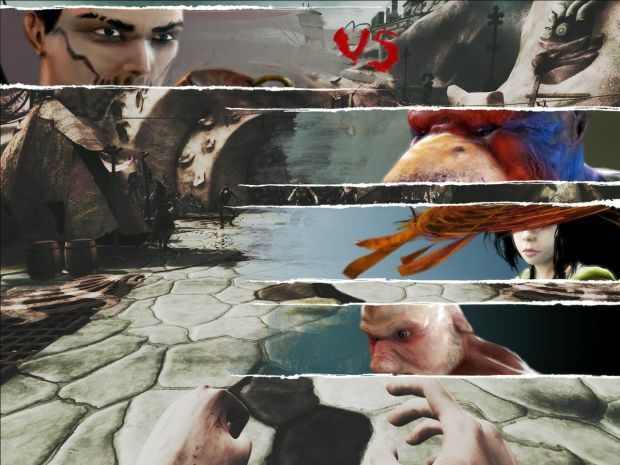 In Zeno Clash you’ll meet a lot of new faces to fight. I can’t say how much, but there are a lot of creatures for the size of the game. ModDB: All of the enemy melee encounters seem like the player is "locked" into the battle. Will you be able to run away from such fights in-game? Bordeu: Yes definitely. 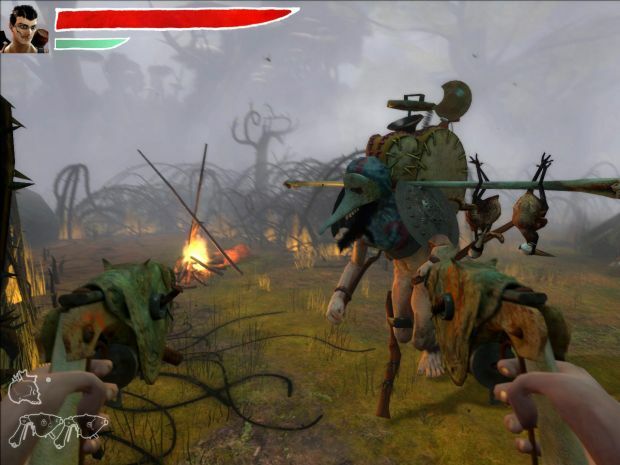 Player’s can manually lock from one adversary to another or unlock to avoid a melee combat. The tricky part is avoiding a close confrontation without getting overrun. Enemies immediately react to a player that is pulling out a weapon, so if you’re close it’s very likely that your weapon will get knocked out of your hands. ModDB: How have you balanced the melee and weapon encounters? If a player wanted to, could he just use a gun or melee the entire time? Bordeu: Players are never forced upon a combat system. The only enemies that require special weapons to defeat them are heavy opponents which require a hammer or a club to finish them off (though you can still fire at them to reduce their health and stun them). A player could attempt to complete a level only using a firing weapon, but as I mentioned above, enemies are well aware of the threat of being shot, so they’ll try to disarm the player whenever they see him aiming a gun. I’ve played many levels with different strategies and the outcome is always different. For instance, I can try to complete a level only depending on my firing weapons. If an enemy charges me and knocks my weapon out of my hands I can still try to quickly run, pick up the weapon, then fire at him and try to knock him off his feet (so I’ll have enough time to reload). On the other hand I can try to resolve everything using only my fists. However enemies that see unused weapons can try to go for them making it difficult to approach them. When you have more than a single adversary it’s very possible you’ll be using or encountering both close combat and far combat tactics. That’s why levels are generally played through a mix of both systems that blend very well. 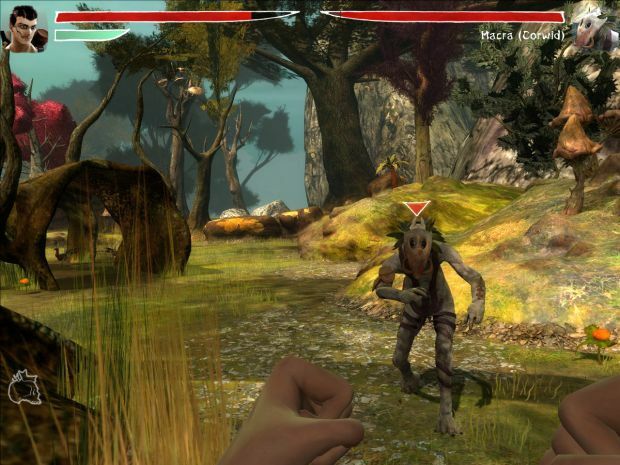 The player’s stamina also plays a big role in far combat tactics vs close combat tactics. If I want to rely only on my firing weapons I’ll have to probably run a lot because weapons don’t always knock down enemies unless you land some well placed shots. You’ll need to keep your distance to reload and if your stamina runs out, so will your ability to run. Stamina regenerates quickly, but it can fall short very fast during a melee fight or when running. ModDB: Again in the summary, you mention unraveling Ghat's past by "playing different timelines" —can you elaborate on that at all? Bordeu: Hahaha. No, there’s no time traveling. Ghat’s story is complex and we didn’t want to tell it in a linear fashion. During the game Ghat tells part of his story to Deadra (the players companion) so she can make sense out of Ghat’s actions. These sequences or raconteurs are played like levels, and during several parts of the game Deadra wants to know more about Ghat’s mysterious past, his relation with Father-Mother and his family. We wanted to use raconteurs to add more complexity to the story. ModDB: So Zeno Clash is going to be released via Steam worldwide; any release date yet? Bordeu: Yes, Zeno Clash will be available through Steam and we’re currently discussing with other parties who might be interested in distributing it through retail channels in certain territories. We’re aiming to have the game ready by sometime during February, which means it should be released during late February – early March. We still don’t have an exact release date. ModDB: Lastly, congratulations on making the shortlist for the Independent Games Festival for 2009! Put up your dukes late February/early March this year. gasp! you broke the first and second rules of fight club! FFS, this makes my mod look crap and I lose all motiviation. it is being made by a professional team and is probably going to be retail, so don't feel too bad. I see it more as something to strive towards. WOW... see guys, we the modders, we can get to a high level of production, the only thing we need its a brain and great ideas HAIL TO THE MOD!!! some people, like myself, like to have a physical item they can hold in their hands. it has more value sentimentally. but yea, if there isnt an option, then i would still buy it on steam. Whoa, this looks really good. Can't wait to try it out! Keep up the awesome work! 1) Release date (I'm assuming some time soon)? 3) Size (est. in GB)?